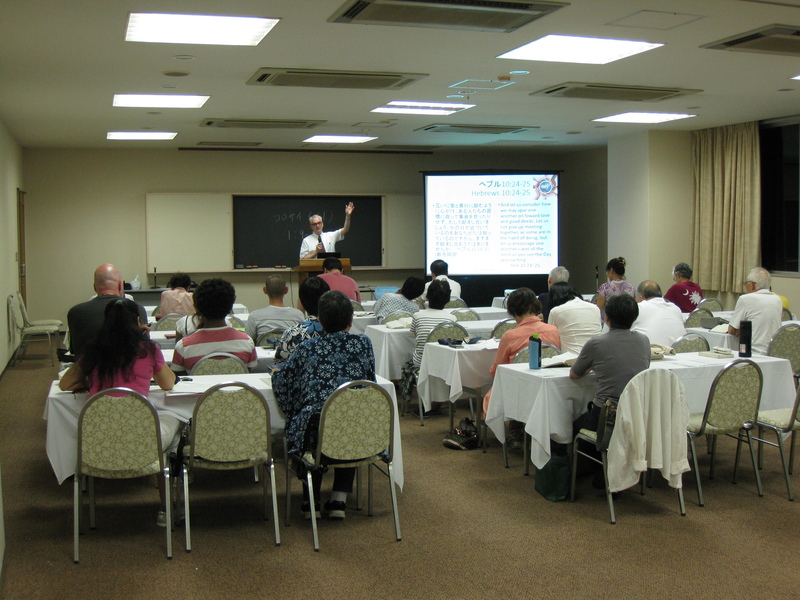 This is the twenty-first consecutive year we’ve ministered in Japan. This year was special in that we made two trips (April 24–June 23; August 14-October 11). The purpose of these trips is to share lessons to help build up the church and to encourage Christians and churches. One of the first things we do upon arriving in Japan is to set up housekeeping and an office. We are taken to Costco to get some food for the time here. This is much less expensive than purchasing smaller quantities at the local grocery store. This is also a time to get back into the Japanese language. 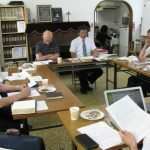 Three days after arriving we participated in the Ochanomizu Bible Camp which is a tradition. This year their theme had to do with preparation for their seventieth anniversary next year. They wanted to reaffirm their vision as a congregation. I shared a lesson on encouragement from Hebrews 10:24-25. “Let us consider how we may spur one another on toward love and good deeds.” Vision must be purposeful and deliberate. We encourage each other to fulfill the vision. For Sunday sermons, I shared the story of the sinful woman who anointed Jesus’ feet and the parable of the two debtors Jesus used to confront Simon (Luke 7:36-50). It is hard to see our true sinfulness which makes it hard to see the vastness of God’s love and forgiveness. The Japanese Interconfessional Translation puts it pretty plainly: “You can tell how much she loves by her actions.” Our appreciation of God’s love is proportional to our understanding of how much we have been forgiven. Paul’s prayer for better understanding of God’s love in Ephesians 3:14-21 is worthy of repeating. The topic for the Japan School of Evangelism lessons was The Atonement. I had spent a considerable amount of time preparing the lessons in English before coming and then worked to get them into Japanese once here. One brother who is fluent in English has been a tremendous help in checking my Japanese and teaching me some of the nuances of the language. 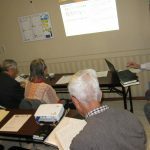 The format this year’s JSE lessons was to have 6 thirty to forty-five minute lessons shared on three Thursday mornings. This format would allow congregations who do not have preachers to share them in a Sunday morning class or worship assembly. Each was recorded on DVD with PowerPoint slides and a class handout to follow the lesson. Lesson topics were: Sin and Atonement; Old Testament Sacrifices; Suffering Servant; Divine Justice; Redemption; While We Were Helpless (a review and meaning of the cross). Some of these were also shared with the Ochanomizu church on four Wednesday evenings. 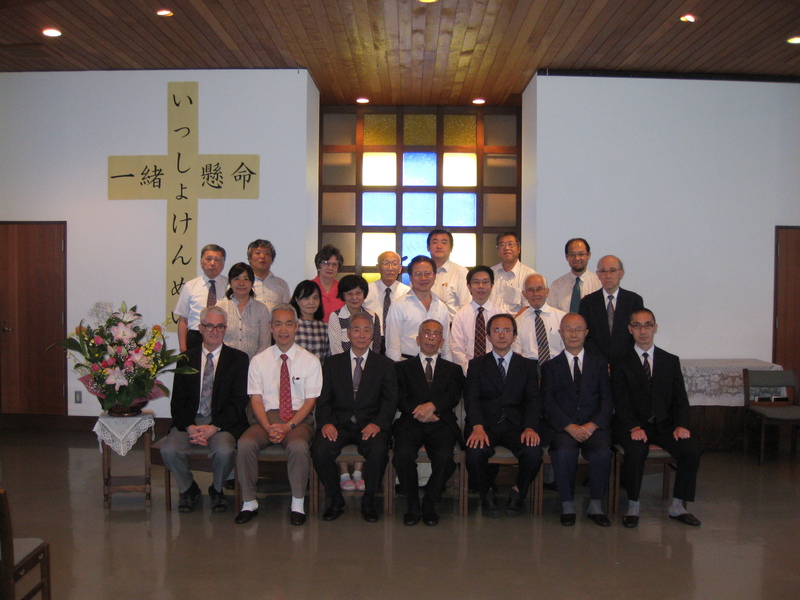 We met with the monthly ministers’ meeting for Tokyo-West ministers at Nogeyama, Yokohama. The minister there shared comments about Martin Luther on the occasion of the 500th anniversary of his work. 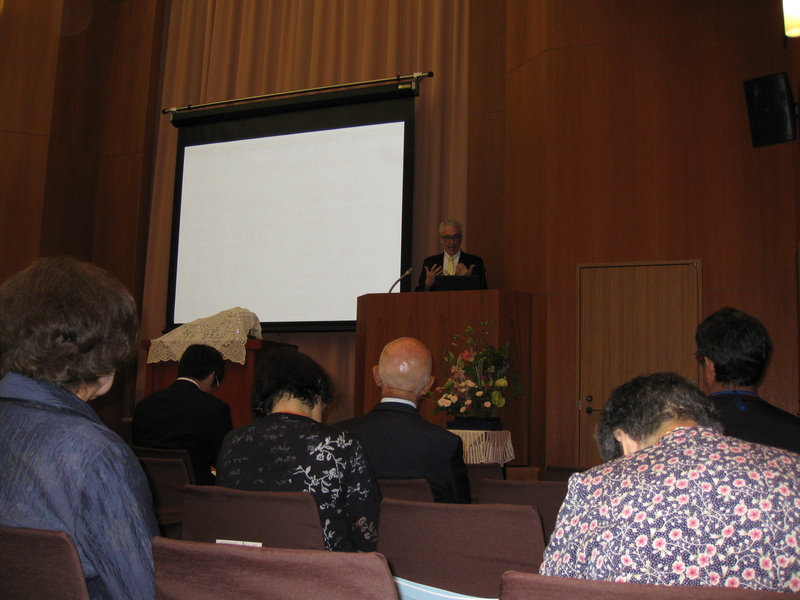 On the third Sunday in September, I shared a bi-lingual sermon with the Ochanomizu church. 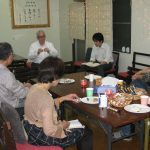 This congregation has a joint Japanese-English worship each third Sunday followed by a fellowship meal together. That afternoon Josephine shared a lesson from Jonah about our inner spiritual struggles. 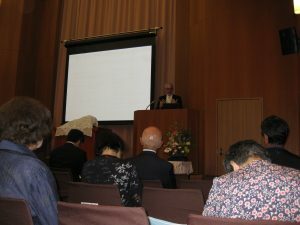 An older minister spoke for the JSE Founding Day Lectureship September 18. He gave some of the history of his work. Following the lectureship, the teachers meet for an overnight planning session. It was encouraging to hear their discussion. The school currently has three students: one is retired and “re-tooling” to work with his home congregation; one is middle aged and is preparing to do what she can in her local congregation; another is younger and soon to be married who is preparing to do what he can in his local congregation. 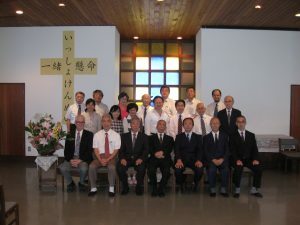 We’ve worshiped with congregations as far north as Aomori and as far southwest as Shizuoka. 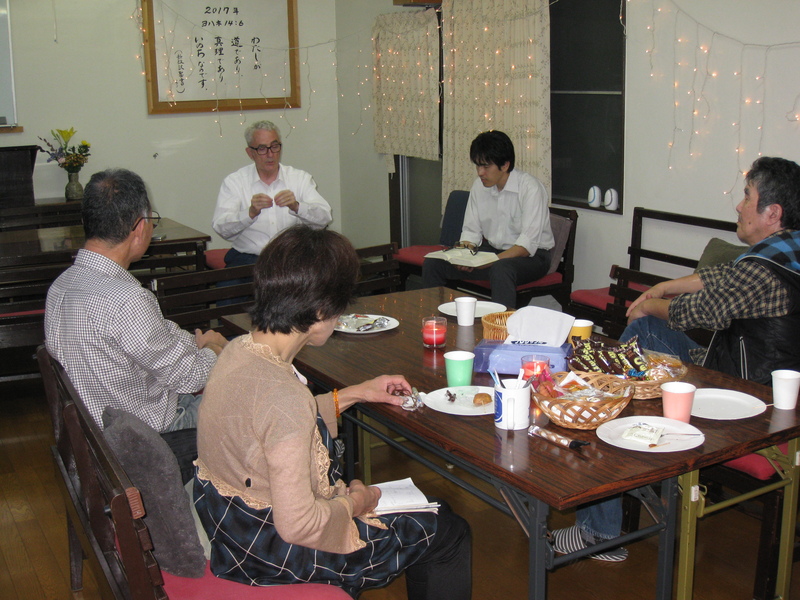 Twelve of us met for worship in Hachinohe, Aomori, filling a small room. 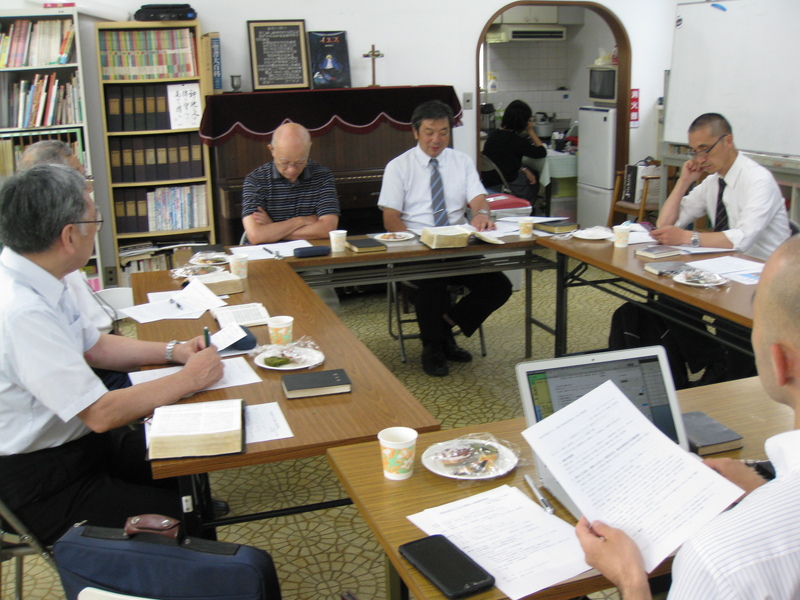 Eight congregations in the Shizuoka area came together to worship and study on our next to the last day in Japan. Getting to both of these involved several hours of travel. The Tomobe congregation has a coffee hour once a month. We participated in that, and I shared a devotional on giving thanks. 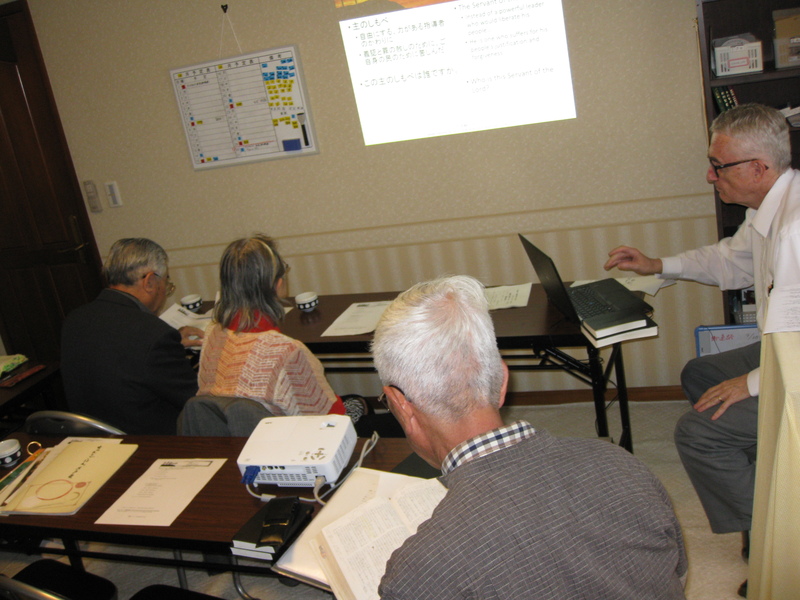 Several non-Christians who are students on English classes the church offers attended. The Tomobe church has an intern working with them at the present who is a big encouragement. Marlin Ray recently had surgery and continues to be hospitalized as he recovers. This surgery was a follow up to a traffic accident in July 2016 when a person ran into him just before he was to share a sermon with the congregation. Jean continues to minister to Marlin and the church. Marlin had permission to leave the hospital in order to attend the worship assembly. He continues to preach once a month. That’s a quick overview of the past eight weeks. Leaving is always bittersweet. We’re sorry to leave behind people who are being faithful to the Lord in the midst of a dark society. We’re looking forward to reuniting with family and church family. God has promised that every effort put forth to share the Good News is not in vain. Ours is to remain faithful to Him and continue to “spur each other on to love and good deeds” which is a response to the forgiveness we have received in Christ.